WOA Romanov is a 15.2h stallion that has straight Russian on his sire lines and a mixture of Polish and domestic bloodlines in the dam line. His Sire, imported *Napadki, is close up Aswan and Priboj through Pomeranets and *Nimpha. Bev Scott of SAI Arabians told me she was one of the best racing mares she had plus a great producer of race horses. Pomeranets is out of Mammona that was one of the fillies that made the 1000 mile trek from Poland to Russian to escape capture by the Nazi’s. An amazing journey that separated the weaker horses from the strong. Read the History of the Russian Breeding Program on our site for a brief overview. On the beauty end of the pedigree we have *Bask and Khemosabi, known for producing halter champions. 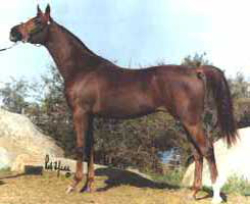 Not many realize that Khemosabi’s sire was English Pleasure Champion and Khemosabi could have been promoted in more performance classes had he not been such a halter champion. His beauty was passed onto his foals. The biggest thrill Mark and I ever had was when Halynov’s 2 offspring beat 2 of Khemo’s offspring at Santa Barbara Get of Sire; one of the trainers made the comment as we were entering the show ring that “we all know who is going to win.” What an honor to prove him wrong. Romanov has that kind of classic beauty -- not extreme or exotic -- just simply handsome. WOA Romanov is a 15.2h stallion that has straight Russian on his sire lines and a mixture of Polish and domestic bloodlines in the dam line. 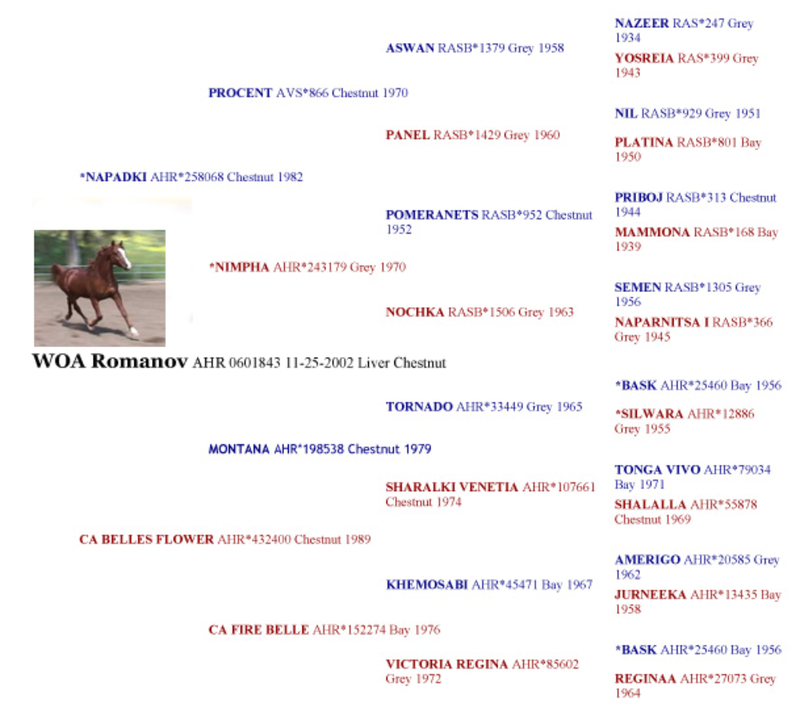 His Sire, imported *Napadki, is close up Aswan and Priboj through Pomeranets and *Nimpha. Bev Scott of SAI Arabians told me she was one of the best racing mares she had plus a great producer of race horses. Pomeranets is out of Mammona that was one of the fillies that made the 1000 mile trek from Poland to Russian to escape capture by the Nazi’s. An amazing journey that separated the weaker horses from the strong. 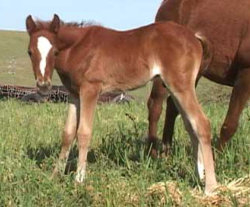 Read the H istory of the Russian Breeding Program on our site for a brief overview. On the beauty end of the pedigree we have *Bask and Khemosabi, known for producing halter champions. Not many realize that Khemosabi’s sire was English Pleasure Champion and Khemosabi could have been promoted in more performance classes had he not been such a halter champion. His beauty was passed onto his foals. The biggest thrill Mark and I ever had was when Halynov’s 2 offspring beat 2 of Khemo’s offspring at Santa Barbara Get of Sire; one of the trainers made the comment as we were entering the show ring that “we all know who is going to win.” What an honor to prove him wrong. Romanov has that kind of classic beauty -- not extreme or exotic -- just simply handsome.